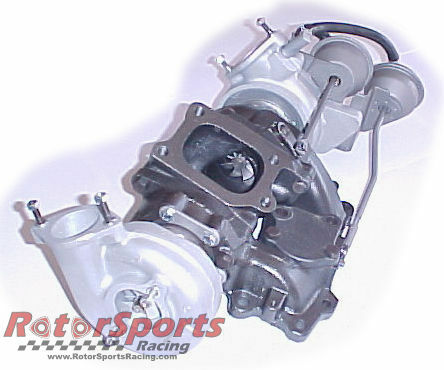 RotorSports Racing carries many different brands of performance and stock parts for all generations of Mazda RX-7. Please call for more information and prices. Tell us what you ultimately want from your car, and we'll match you with the right turbo upgrade. Many ask what is the ideal turbo setup for an RX-7. However, this really depends on what your expectations are. While "turbo lag" is not as evident as with earlier generations of turbos, smaller turbos generally produce quick spool up times but limit top end power. Larger turbos generally sacrifice low end power for top end performance. Factors like ball bearing or standard, compressor wheel trim, AR sizing, and more will affect any turbo and it's performance. Renew that twin turbo exhilaration! There's no single turbo substitute for the instantaneous response you get from the stock twins. While single turbo conversions will yield more power once you get them spooled up, the twins yield more power quicker at the lower spectrum of the power band with great throttle response. For those who want to retain quick response, want to keep a stock format, or simply enjoy the excellent streetability that comes with the twin turbos, then make it simple with a rebuild when needed. The Turbonetics "T-SERIES" turbo family incorporates the latest "STATE OF THE ART" turbocharger aerodynamics and the toughest durability available to the maximum performance engine builder. With a wide range of flow capacities (TSO4, T61, T64, T66, T70, T72 and T76) capable of supporting 600 to 1200 HP with a "single" turbo, the "T-SERIES" is the only true custom turbo family designed exclusively for racing applications! All "T-SERIES" turbos are custom built to your specific application and include the TURBONETICS "Tuff-Turbo" option. Dynamic seal is standard. Your choice of O or P trim turbine; .58, .69, .81 or .96 A/R "on-center" turbine housing; dry or water-jacketed bearing housing - specify when ordering. 1.30 A/R "on-center" and a full range of tangential style turbine housing are optional. "Q" trim and the exclusive TURBONETICS CERAMIC BALL-BEARING option are available. Turbonetics' TO4B and the TO4E series are the most versatile turbochargers available to the performance aftermarket. High compressor efficiency, strict quality standards, TURBONETICS' exclusive "blueprinted" assembly process and competitive pricing makes the TO4B and the TO4E the obvious choice for many applications. Available in wide range of compressor and turbine combinations, the TO4B/TO4E family can support power levels from 300 HP to 550 HP for single turbo applications and over 1000 HP for twin turbo applications on engines from 100 CID to 500 CID. TO4B/TO4E turbochargers are also available with TURBONETICS' exclusive "Tuff-Turbo" option and the equally exclusive (patent pending) TURBONETICS' CERAMIC BALL-BEARING option. The 62-1 represents TURBONETICS� efforts to produce a premium turbocharger for the engine builder looking for that extra �edge� of power. Based on hand selected compressor components precisely contoured on computer controlled machining centers, the 62-1 delivers an honest 10% greater airflow than the standard 60-1. The 62-1 is not for every one, but if you can handle its potential, the expense will be well worth it. Both the 60-1 and the 62-1 are available with the exclusive Turbonetics "Tuff Turbo" option for superior durability. Note: All standard 60 Series turbochargers include your choice of O or P trim turbine; .58, .69, .81, .96 A/R �on-center� turbine housing; dynamic or carbon (except �Big Shaft�) seal; wet or dry bearing housing - specify when ordering. 1.30 A/R �on-center� and a full range of tangential-style turbine housings are available as options.